Young scientist, Victor Frankenstein, creates an intelligent but grotesque living creature in a fantastic scientific experiment. 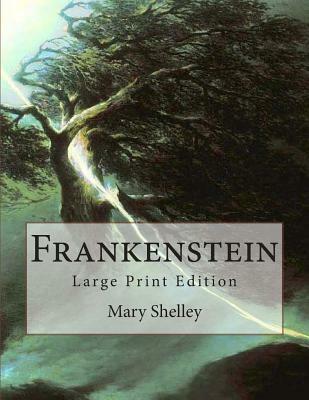 Written by 18 year old Mary Shelley, Frankenstein stands as one of the masterpieces of nineteenth-century Gothicism. "Accursed creator Why did you form a monster so hideous that even you turned from me in disgust? God, in pity, made man beautiful and alluring, after his own image; but my form is a filthy type of yours, more horrid even from the very resemblance." This excellent edition is printed on high quality paper with an attractive, durable cover. Mary Shelley (Mary Wollstonecraft Godwin; 30 August 1797 - 1 February 1851) was an English novelist, short story writer, dramatist, essayist, biographer, and travel writer, best known for her Gothic novel Frankenstein: or, The Modern Prometheus (1818). Her father was the political philosopher William Godwin, and her mother was the philosopher and feminist Mary Wollstonecraft. Mary Godwin's mother died when she was eleven days old; afterwards, she and her older half-sister, Fanny Imlay, were raised by her father. When Mary was four, Godwin married his neighbour, Mary Jane Clairmont. Godwin provided his daughter with a rich, if informal, education, encouraging her to adhere to his liberal political theories. In 1814, Mary Godwin began a romantic relationship with one of her father's political followers, the married Percy Bysshe Shelley. Together with Mary's stepsister, Claire Clairmont, they left for France and travelled through Europe; upon their return to England, Mary was pregnant with Percy's child. Over the next two years, she and Percy faced ostracism, constant debt, and the death of their prematurely born daughter. They married in late 1816 after the suicide of Percy Shelley's first wife, Harriet. In 1816, the couple famously spent a summer with Lord Byron, John William Polidori, and Claire Clairmont near Geneva, Switzerland, where Mary conceived the idea for her novel Frankenstein. The Shelleys left Britain in 1818 for Italy, where their second and third children died before Mary Shelley gave birth to her last and only surviving child, Percy Florence. In 1822, her husband drowned when his sailing boat sank during a storm in the Bay of La Spezia. The last decade of her life was dogged by illness, probably caused by the brain tumour that was to kill her at the age of 53. Scholars have shown increasing interest in her literary output, particularly in her novels, which include the historical novels Valperga (1823) and Perkin Warbeck (1830), the apocalyptic novel The Last Man (1826), and her final two novels, Lodore (1835) and Falkner (1837). Studies of her lesser-known works such as the travel book Rambles in Germany and Italy (1844) and the biographical articles for Dionysius Lardner's Cabinet Cyclopaedia (1829-46) support the growing view that Mary Shelley remained a political radical throughout her life.